Serta iComfort Blue 100 Mattress - The Right Bed For You? Home » Serta iComfort Blue 100 Mattress – The Right Bed For You? Serta iComfort Blue 100 Mattress – The Right Bed For You? Serta’s iComfort line is designed to be comfortable and cooling. 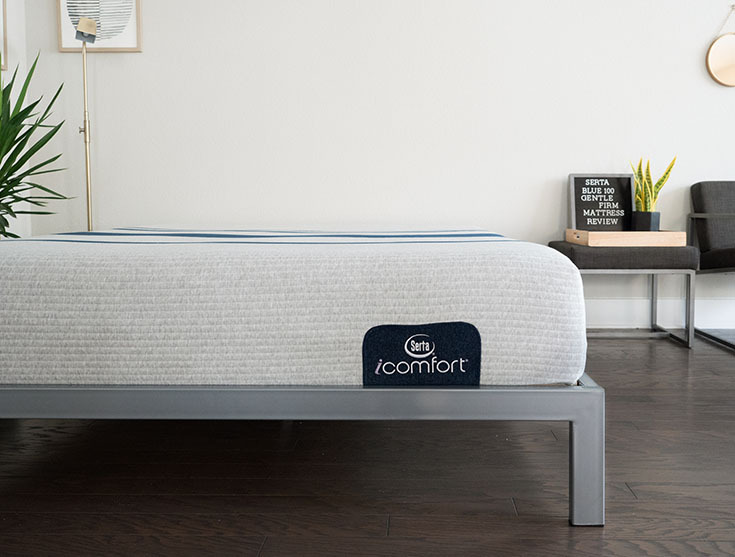 The memory foam iComfort contingent is made up of seven mattresses ranging in firmness, so you could easily find the foam mattress that meets your needs. I received the Blue 100 Gentle Firm mattress to review. It is near the middle of the iComfort’s firmness scale. Because of this, I expected it would be a best for back sleepers. Will this mattress give you the support you need on your back while still keeping you cool? Read on for my full review. You are a back sleeper. As long as you are not over 250 lbs, this mattress should give you the support you need when you are on your back. The foam should press into your lumbar area and keep your spine neutrally aligned. You are a hot sleeper. This mattress is made to keep you cool while you sleep. Both of the top layers are designed to be breathable and dissipate heat. You shouldn’t be sleeping hot on this mattress. You prefer a classic memory foam feel. If you like to slowly sink into your mattress and feel enveloped, this could be the mattress for you. It does have that quicksandy feel and allows you to sleep more “in” the mattress. You are a stomach sleeper. If you sleep primarily on your stomach, support is very important. You want to ensure that your hips don’t sink in too far so that your spine gets out of alignment. I think that stomach sleepers of many sizes will need more support than this mattress has to offer. You are a much heavier person. If you are over 250 lbs, you will probably not get enough support when you are on your back or stomach. When you are on your side, you might press through the softer comfort layers and feel the support layers beneath. The mattress is 9.75” tall. The cover is soft and has a sweatshirt-like feel. The first layer is ¾” TempActiv™ Gel Memory Foam. Then, there are 2” of EverCool® Fuze™ Memory Foam. Next, there is 1” of a transition foam. The base is 6” of Serta® Ultimate Edge® Foam Core. The mattress is made in the USA. Check out our overview of the Serta iComfort line. The Blue 100 Gentle Firm is available in Twin, Twin XL, Full, Queen, King, and California King. The cover is thin and allows you to engage with the top comfort layers. The top two layers of memory foam are very soft. Since these add up to just under 3”, this means that heavy people might press through these top layers and hit the support layers. Because of this, they may think the mattress is firmer than a lighter person might think. These top layers are also specifically designed to keep this mattress cool. The first layer is infused with gel to promote heat dissipation. The second layer is also breathable. All in all, you shouldn’t be sleeping hot on this mattress. In terms of firmness, I thought the Blue 100 Gentle Firm felt like a 7.5/10. I will note that I am a heavier person and weight 230 lbs. I do tend to press into mattresses more than a lighter sleeper may. They may find this mattress to be softer than I did. Lying on my back, I feel very well supported. My hips sink into the mattress just the right amount, and the top foam layers press up into my lumbar area. On my side, I feel some pressure on my shoulders and hips. Again, lighter side sleepers may have a different experience because they won’t press into the mattress as far as I did. Also, on my stomach, I definitely need more support. In terms of feel, the Blue 100 Gentle Firm has a classic memory foam feel. I feel myself slowly sink into the mattress when I lie down. There is only a bit of bounce, so it isn’t the easiest to move around on the mattress without feeling stuck. Read all about the Blue 300 model. If you sleep with a partner, the Blue 100 Gentle Firm could be a great choice. I tested how well it handled motion transfer by placing a glass of water on the mattress and pressing into the surrounding area. The glass and water were barely disturbed. In addition, I asked Joe to move around on the other side of the mattress while I was lying down. I could barely feel his motion on my side of the bed. None of this is surprising considering how well memory foam is known to absorb motion. The Blue 100 Gentle Firm could be a great mattress for couples. When I sit near the edge of the mattress, those soft foam layers compress very easily. However, the base foam is quite dense, so I feel somewhat secure sitting down. Lying down, again the mattress compresses. I get a slight feeling that I may roll off the mattress. For an all-foam mattress, I would say the edge support is decent. Marten said it was a 7.5/10, but I thought it was closer to a 7/10. The top layers are pretty soft, but I do press through those. On my back, the mattress was a good match for me. My hips were allowed to sink in, but not too much. The mattress conforms well to the curves of my body. On my side, I feel like I press through the comfort layers and bottomed out a bit. 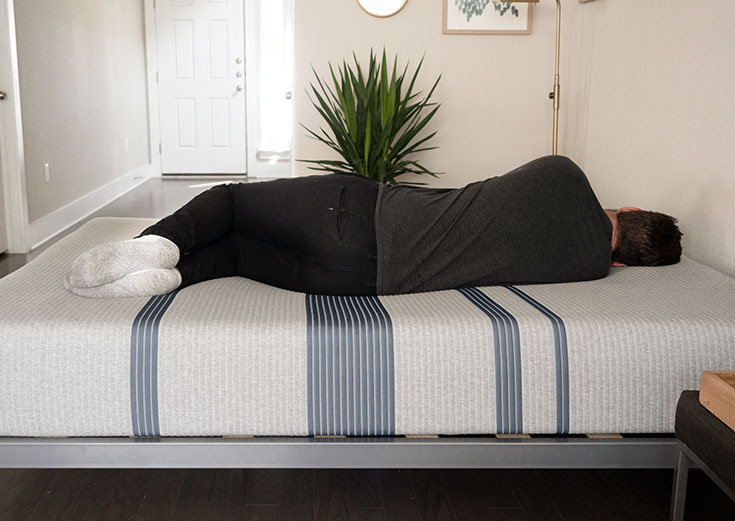 If you are 125 lbs or less, this mattress could work for you on your side. If you are heavier than that, you might bottom out and think this mattress is too firm. On my stomach, I did need more support. Overall, if you are my body type, back sleeping is good on this mattress. If you are a lightweight side sleeper, this could work for you. If you are a stomach sleeper, I would try to look for something more supportive. Joe and I actually had very similar experiences, even though he thought the mattress was a bit softer than I did. He also pressed into the mattress and felt the support layers underneath. This lets me know that someone would have to be very lightweight to get good pressure relief on their side. It should do a good job of keeping you cool while you sleep. The two top layers are both designed to dissipate heat and keep the mattress breathable. The mattress has a nice, classic memory foam feel. Fans of the quicksandy, slow-sinking feeling of memory foam will feel right at home on the Blue 100 Gentle Firm. 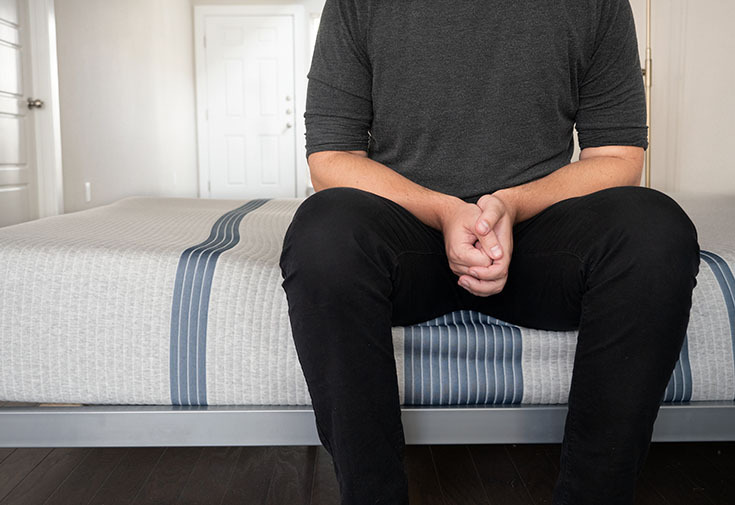 Back sleepers of many sizes should find the support they need on this mattress. The top layers are soft, but the transition and support layer should keep you from sinking in too far. If you like the classic feeling of memory foam and you are a back sleeper, the Serta iComfort Blue 100 Gentle Firm mattress may be a great match. However, if you are a stomach sleeper or side sleeper of average or heavyweight, you might want to look elsewhere. There are six other models in the iComfort line that could fit your needs.